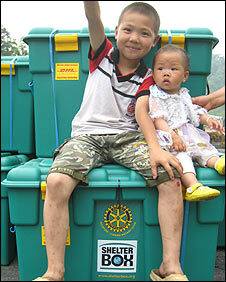 Aid workers from the charity Shelterbox have begun handing out aid boxes to survivors of the Chinese earthquake. The Cornish-based organisation has sent 800 boxes and a team of volunteers to Chengdu province. They have been visiting the disaster zone, deciding where the boxes should go. Each contains enough equipment to house a family of 10 for six months. "Tents are up and the locals are extremely happy," said team leader Pat Prendergast. The first consignment of 200 boxes have been split into two lots of 100 for the villages of Pengzhou and Bailu. "The Chinese people we have met have been brilliant, sadly though we can only help a few thousand of this vast population, more tents are desperately needed," Mr Prendergast added. Tom Lay, a member of the ShelterBox Response Team, said people had spread themselves along the mountain pass because they are too scared of aftershocks to remain in town. "We spoke to the mayor of a small community which is in need of 3,000 tents. "But he said people further up the mountain were in more desperate need and we should use the ShelterBox equipment there." Mr Lay said people have joined together to help each other. Meanwhile, volunteers at the Falmouth-based charity are preparing to send more tents and boxes to the earthquake area. According to official figures more than 5.47 million people were made homeless in the earthquake on 12 May. The official death toll is now more than 55,239 and another 24,949 people are still missing. Shelterbox has also recently sent 1,600 boxes to Burma to assist the victims of the cyclone.